President Bush urged OPEC nations on Tuesday to put more oil on the world market and warned that soaring prices could cause an economic slowdown in the United States. "High energy prices can damage consuming economies," the president told a small group of reporters traveling with him in the Mideast. "It's affected our families. Paying more for gasoline hurts some of the American families, and I'll make that clear to him," said Mr. Bush, heading into more talks with Saudi King Abdullah. Shortly after Mr. Bush spoke, the Saudi oil minister said the kingdom, responsible for almost one-third of the cartel's total output, would raise oil production when the market justified it. "Our interest is to keep oil supplies matching demand with minimum volatility in the oil market," Oil Minister Ali Naimi told reporters. "We will raise production when the market justifies it. This is our policy." Naimi said inventory levels appear to be "normal," adding, "we want the inventories to be healthful, but we don't want it to be extremely high or extremely low." Naimi said the U.S. economy is significant to the oil market and demand. "I'm sure no one will look with pleasure on a recession in the U.S. On the contrary, all our effort is to maintain prosperity and growth in all countries, particularly the number one consuming nation in the world," he said. But the minister said oil is not the only reason for the slowing U.S. economy. "The concern for the U.S. economy is valid, but what affects the U.S. economy is more than the supply of oil," he said. In a stern warning to Iran days after a Jan. 6 confrontation with U.S. warships in the Persian Gulf, Mr. Bush put Tehran on notice that it needs to be careful. The president said it would not matter to him whether an attack against an American vessel resulted from an order by the government in Iran or a rash decision by an Iranian boat captain. "It's not going to matter to me one way or another," Mr. Bush said. If the Iranians hit a U.S. ship, "there are going to be serious consequences," he said. U.S. officials claim Iranian speedboats swarmed three Navy warships in the Strait of Hormuz, the narrow waterway that is the only entry and exit to the Persian Gulf. They said U.S. Navy commanders were considering firing warning shots, before the retreat of the five Iranian speedboats, which the Pentagon said were operated by the elite Revolutionary Guards. Iran has denied that its boats threatened the U.S. vessels, saying the incident was a normal occurrence, and accused Washington of fabricating video and audio it released. Iran's government has released its own video, which appeared to be shot from a small boat bobbing at least 100 yards from the American warships. The president spoke to reporters before meeting late Tuesday with Abdullah, whose country holds the world's largest supply of oil. Mr. Bush said U.S. consumers are feeling the pain of rising oil prices, which topped $100 a barrel this month. "When consumers have less purchasing power, it could cause the economy to slow down," Mr. Bush said. "I hope OPEC nations put more supply on the market," he added. "It would be helpful." The Organization of Petroleum Exporting Countries next meets Feb. 1 in Vienna, Austria, to consider increasing output. OPEC oil accounts for about 40 percent of the world's needs, and OPEC ministers often follow the lead of the Saudis when discussing whether to increase production to take the pressure off rising prices. The Saudis' views carry great weight because of its large share of output. At the same time, he acknowledged that the higher prices reflect supply and demand, and that there is little excess capacity in the marketplace. Mr. Bush said a growing demand for oil, especially from fast-growing India and China, is straining supply and lifting prices. "Oil is commodity," he said. "It isn't something that you just turn on a tap. It requires investment, exploration, a lot of capital." "A lot of these oil producing countries are full out" in terms of what they can produce, he said. Asked whether he thought the U.S. economy was sliding toward recession, as some economists predict, Mr. Bush said, "These are times of economic uncertainty, but I have confidence in the future." He said the underpinnings of the economy were strong, and "I'm optimistic." His administration and Congress are looking at ways to give the economy a boost. Options include tax cuts, tax rebates and other incentives. Asked what steps he believed were necessary, Mr. Bush said: "We're going to watch very carefully." The pressure over oil prices came a day after President Bush delivered a sophisticated weapons sale for Saudi Arabia, trying to bolster defenses against threats from Iran and muster support in the oil-rich kingdom for a long-stalled Mideast peace agreement. Meanwhile, Secretary of State Condoleezza Rice, traveling with Mr. Bush in the Mideast, slipped away from the Saudi capital at 6:40 a.m. Tuesday for a quick trip to Iraq. Mr. Bush said he had been encouraged by signs of progress in Baghdad and decided that she could "help push the momentum by her very presence." Mr. Bush said he would not go to Iraq while traveling in the region. There had been widespread speculation he would make a visit. One of the primary objectives of trip is to build support for the Israeli-Palestinian peace process. He said that Abdullah asked him why he was optimistic about securing an agreement before his White House term ends in January 2009. "Part of my mission was to make clear why talks failed in the past. There wasn't participation by the neighbors," Mr. Bush said, referring to Arab countries that have kept an arm's length from the negotiations. Mr. Bush said he was convinced that the Arab leaders want to see the creation of a Palestinian state in a peace agreement with Israel. "They definitely want it to happen," he said, "and they questioned the seriousness of the United States to remain involved in what has been a long and frustrating process." "They want to see a deal done," he said. "The issue frustrates them." Mr. Bush spoke to the group of reporters while sitting in a chair under a gold and crystal chandelier in an ornate room of the kingdom's guest palace. Mr. Bush said he has faced persistent questions during his trip about a new U.S. intelligence estimate that said Iran had abandoned its nuclear weapons program in 2003. That conclusion contradicted Mr. Bush's claim that Iran was pursuing nuclear weapons and raised questions in the Mideast about U.S. intentions toward Iran. 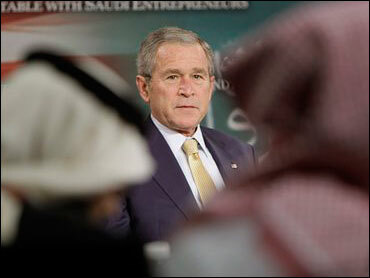 Earlier, Mr. Bush spoke before meeting with Saudi business owners, many of them young and educated in the United States. He then visited al-Murabba Palace and The National Museum, stopping in a gallery describing the Prophet Muhammad's life. Afterward, he was traveling to Al Janadriyah Farm, the king's country retreat where he maintains 150 Arabian stallions. That trip repays the two visits that the king, while crown prince, made to Bush's ranch in Crawford, Texas, in 2002 and 2005.